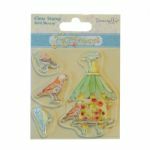 A charming bird house stamp surrounded by a variety of individual wild birds. Pack contains 4 clear stamps. 5 sentiment stamps to coordinate with the Forget Me Not collection, perfect for adding the finishing touch to craft projects. 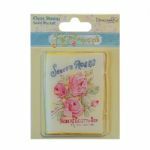 A gorgeous vintage seed packet stamp; a great addition to the Forget Me Not papercraft range. Pack contains one clear stamp measuring 7.5 x 9.5cm.